Laxfield is a large, relatively remote village, and its church has a surprisingly urban setting, with its railings onto the wide main street, the shop on one side, the pub on the other, and the former guildhall opposite. This could easily be a quiet part of a former medieval city, Norwich or Bristol, perhaps. That Laxfield is very much off the beaten track makes it doubly surprising. Unusually in Suffolk the tower is faced in stone, the knapped flint has been used only sparingly. 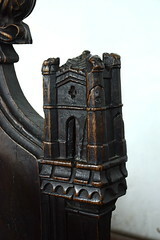 It is reminiscent of Eye, and Sam Mortlock thought his might be because Eye priory held the living here, although, as Simon Cotton has pointed out, this tower is a little older than Eye's. 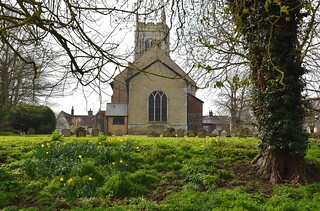 Redenhall church in Norfolk is another similar tower which is called to mind, and it seems likely the same masons were involved in all three. 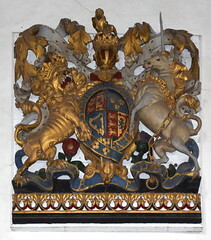 Shields of the Wingfields bear witness to the involvement of that most influential of families in this part of Suffolk. 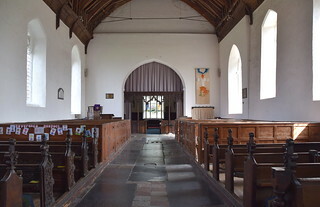 The nave is perhaps the work of a century earlier than the tower, and the disappointingly dumpy porch is a result of the removal of the upper storey some time after the Reformation. As if the stonework of the tower were not singular enough, the rebuilding of the east end of the nave and of the entire chancel was carried out in white brick in the 1820s. This is too early for the influence of the Liturgical Movement of that century to have insisted on the proper medieval materials, but it is attractive in its way. 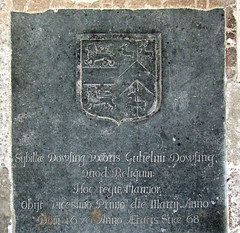 William Dowsing, the great iconoclast, was born in Laxfield, and retained his family house and land here, but he spent most of his time at his other houses in Baylham and Stratford in the south of the county. 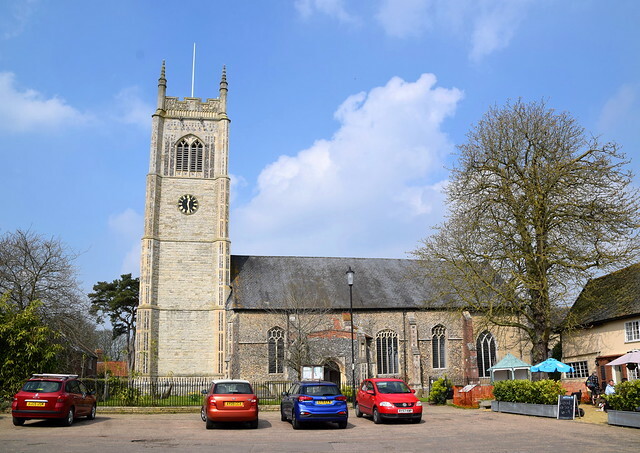 Interestingly, the visit to Laxfield church to check it for Catholic imagery that is recorded in his journal on Wednesday, 17 July 1644 was in isolation from the rest of his tour around Suffolk and Cambridgeshire's churches. This suggests that he was already in the area for other reasons, perhaps connected with collecting rents on land he owned in the parish. Dowsing found rather more at Laxfield to disapprove of than he had in many churches elsewhere. 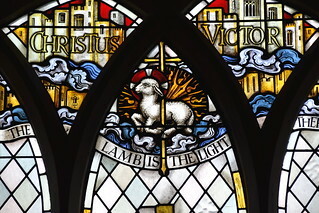 There were angels and crosses on the roof and porch, images in stained glass, possibly a stone carving or two, possibly two bench ends of evangelistic symbols, and brass inscriptions indicative of Catholic practice. 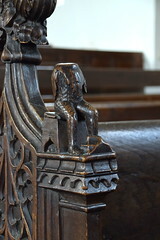 He also ordered the chancel steps to be levelled. These had been recently uplifted as part of the Laudian reforms, which the Puritans thought suspiciously Catholic. Laud would be beheaded six months after Dowsing's visit here. Dowsing entrusted the work here to his nephew in the village, also called William Dowsing, one of numerous Dowsings in 17th Century Laxfield, and there is still a Dowsing Farm in the neighbourhood. 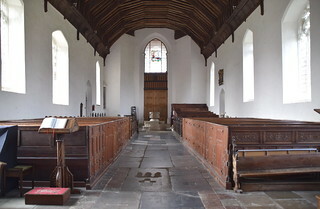 The younger William and his wife Sybil are buried under ledger stones in the church. Dowsing is often accused of being solely responsible for the wrecking of Suffolk's churches, which, quite plainly, he wasn't. 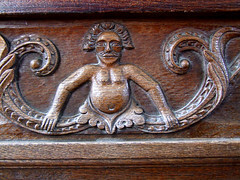 The great holocaust of Suffolk church interiors had been carried out a century earlier, by Anglican vandals in the last years of Henry VIII, and under the thankfully brief fundamentalist regime of the boy-king Edward VI. This was when altars and statues were smashed, rood-lofts and images torn down, vestments and mass-books thrown on to bonfires, gold and silver plate looted and melted down. Much of this was likely to have been carried out by mobs in a drunken frenzy. Dowsing's was a mopping-up operation, checking for 'that which was not formerly removed'. 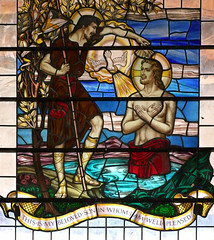 His hit-list was the chancel steps recently introduced by Laud, images in stained glass (many of these had survived the Anglican reformers, because of the sheer inconvenience of replacing them), angels on the roof beams, crosses and statues in inaccessible places, and brass inscriptions referring to the cult of the dead. 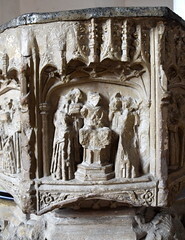 Occasionally, he circumscribed a font, as at Hacheston. 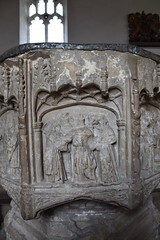 This is interesting, because in three of the Suffolk churches he visited, Badingham, Cratfield and here, at Laxfield, there survive three of the finest seven sacrament fonts in the kingdom. 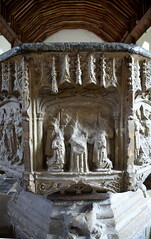 These fonts are the height of Catholic imagery, and were produced at the highest moment of Catholic popularity and practice in the middle of the 15th century. Why did Dowsing not destroy them? Perhaps he felt that simply mutilating them was enough, although he does not mention doing this, and there is some evidence that this had occured 100 years before. Perhaps he did not think them superstitious, in the sense that worship was unlikely to be offered to them. 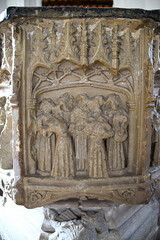 This was probably how the font cover at Ufford survived, presuming the statuettes had been removed before he got there. 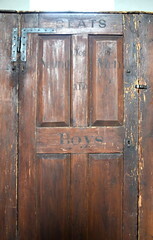 Most likely of all, they were hammered flush, and plastered over, a century before Dowsing's visit. The first impression on entering this great church is its sheer size. There are no aisle, no clerestory, just a vast roof spanning 36 feet across the mighty space, one of the widest in Suffolk. 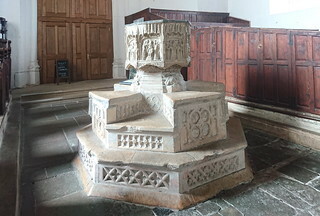 Hemmed in by doored pews set at a camber at the west end is the Seven Sacraments font, a breath-taking object. If this was in the V&A in London, people would happily travel just to see it. It is set at the centre of a great Maltese cross, the gaps between the arms of the cross intended for priest and baptismal party. The bowl has no shaft and is set directly on the base. The seven sacraments are set in arcades. 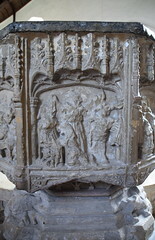 The north-east panel shows the baptism of Christ, and then the others, in clockwise order, are matrimony, baptism, ordination, confirmation, mass, confession and last rites. 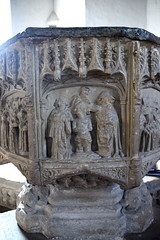 It is common for the odd-panel-out to face east or west, so this bowl may have been moved at some point. It would be fair to say that the scenes are not as intricate or artistically fine as at neighbouring Cratfield, as characterful as at Badingham as close in the other direction, as mysterious as Westhall. But they are very fine, and probably have more in common with Westhall than the others. 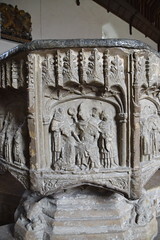 Simon Cotton tells me that will evidence dates this font to the 1460s. 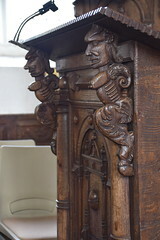 The banked sets of early 19th Century box seats in the north-west and south-west corners of the nave were intended for scholars, and you can still make out the labels on them. You can see something similar on the other side of Suffolk at Kedington. 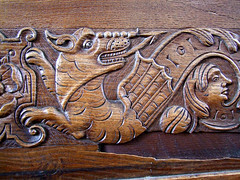 There are other good benches from a century or so either side of the Reformation, although not much survives of medieval evidence. Traces of paint at the east end of the mighty roof suggest that there was once a canopy of honour to the rood here. Unlike at nearby Metfield, it was painted directly onto the beams. Above the west door there is an unusual plaster royal arms of Queen Anne. 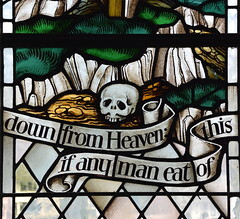 Francis Spear's crucifixion in the east window is a suitably striking end to the view down the drama of this grand space. And there are the little details. 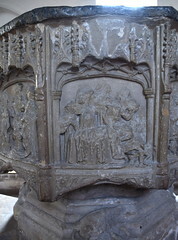 Look at the reading desk in front of the pulpit. It must date from the late 17th or early 18th centuries, but the two supporting figures are exotic in the extreme. 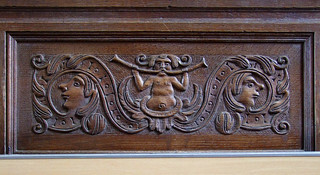 They depict two buxom figures, typical subjects of the time on domestic furnishings, but they do not appear to have been reused from elsewhere. 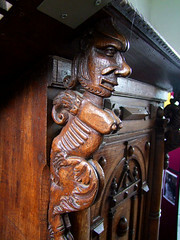 It is tempting to think of them as pagan, but they are more likely the work of a local carver. Perhaps he had visited the south seas on a trading ship in his youth, and had never forgotten it.